There is a haze across the horizon, the morning sky is full of pastel pinks and blues muted by the smoke haze from the cane fires. An overcast sky teases with a promise of rain but the sun breaks through and the promise becomes a joke. The bird life at the moment is raucous. Shrill tweets from peewees, coos from pigeons and, of course, the incessant crows. Each morning I am woken by the large family of kookaburras who are welcoming in the day and each evening they farewell the sun. A peewee greets me by sitting on my windowsill screeching hello, while the black dog from next door scrambles over the fence and scampers down the road. A few minutes later (giving the black dog ample escape time) the Jack Russell barks to let everyone know she’s out again. There is so much happening and amongst the cacophony a kookaburra lets out an enormous laugh right next to the fence. He sits very still and undisturbed by my presence. He is obviously telling me he wants his photo taken so I grab a camera. 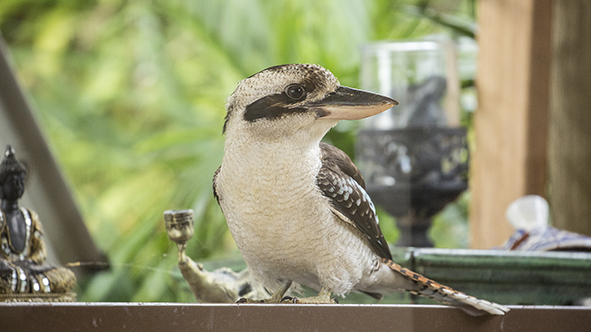 In past years the kookaburras have been known to sit on the sill and peck at the flyscreen, but not today. This one hasn’t come that close to the house and sits on the fence for a bit and then taking flight across to the BBQ area. Here he looks around and notices there are no morsels left on the plate and decides to rest a while before heading off to the avocado tree. A familiar thud takes me to the other side of the house to find a Little Wattlebird has flown into the window. It sits stunned opening its beak and looking dazed. I google ‘what do you do when a bird hits your window?’ and find a box, put some holes in it, grab a pair of gloves (all after I have taken some photos and given it some time to recoup – naturally) and then attempt to rescue it in my best David Attenborough stealth style. There is a huge flurry as I approach and it seems that a rescue was not part of the birds plan. It hopped to a couple of trees and then flew off. Links to Planet Corroboree are here so you can learn more names in language. Perhaps I could be doing something else.